A shooting took place Tuesday, January 23, 2018, at Marshall County High School in Benton, Kentucky. (CNN) - Kentucky's governor has declared Sunday an official day of prayer for Marshall County, a solemn gesture honoring the victims of this week's school shooting in the western part of the state. Gov. Matt Bevin signed the proclamation at an event Friday in Benton supporting the community, where he and Lt. Gov. Jenean Hampton joined other politicians, clergy, family members of victims and residents. A day earlier, Bevin ordered the state flag lowered to half-staff until sunset Tuesday, a week after two students died in the Marshall County High shooting. "I urge Kentuckians of all faiths to pray earnestly for God's comfort upon the victims and their families, God's healing for those injured and God's solace for all who are present," Bevin said. "I also urge prayers of gratitude for the first responders and all those on site who acted selflessly to ensure more lives were not lost." People were grief-stricken at the Bevin ceremony, where several hundred attended. Speakers lauded first responders, expressed admiration for the community's faith and spirit, and emphasized the power of prayer. Hampton, the lieutenant governor, said she wished she knew the slain youths, saying "they were the kind of people who represent the heart and spirit and soul of Kentucky." "I know that the communities will rally around the families, rally around the families long after the cameras are gone, long after the media is gone. I hope you will continue to support these families because that's when they're going to need you, when things get quiet," she said. "I hope you'll check in on them. I plan to do that." She urged students to live their lives in a way that honors their slain schoolmates -- Bailey Nicole Holt and Preston Ryan Cope, both 15: "Do good in their memory, live well in their memory to honor them." "I pray for Kentucky's kids. I asked God to assign an angel to every Kentucky child," she said. "I ask God to give you comfort in this terrible time." 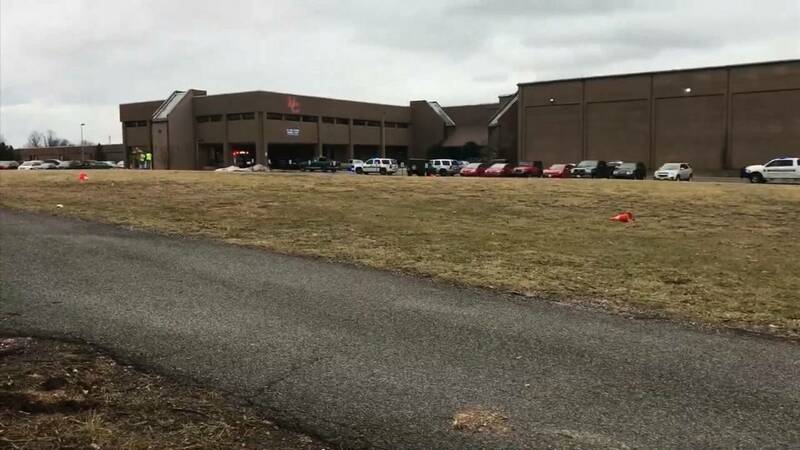 Students returned to Marshall County High on Friday, three days after a 15-year-old boy opened fire there, killing the two students and wounding 16 people, CNN affiliate WZTV reported. They gathered in the school gym -- usually filled with cheering crowds of basketball fans in orange and blue -- for an assembly. Classes resumed afterward. Students will return this weekend to pay final respects to the two teens who were gunned down. Visitation for both will be Saturday afternoon in the gym, with their funerals to follow Sunday. "She called me, and all I could hear (were) voices, chaos in the background," the girl's mother, Secret Holt, told CNN affiliate WKRN. "She couldn't say anything, and I tried to call her name over and over and over, and she never responded." After the gunfire, buses took surviving students to another school, where parents waited. Secret and Jasen Holt waited for Bailey to walk off one of the buses. But she never did. Bailey always put others first and knew she wanted to be a labor-and-delivery nurse, her family said. "She was perfect in every way," father Jasen Holt told WKRN. "She was an angel here on Earth. She was a perfect angel." Brian and Teresa Cope were able to reach their son Preston as he lay on a stretcher. They told The Louisville Courier-Journal how gratified they were to see him and tell him they loved him shortly before he died. "He was such a good son. I know he's in a better place than we are and we will all see him again," Brian Cope told the newspaper. The suspect -- who was not identified because he is a juvenile -- was charged with two counts of murder and 12 counts of first-degree assault, Marshall County Assistant Attorney Jason Darnall said. He remains in custody after making his first court appearance Thursday, Darnall said. Prosecutors are expected to ask for the case to be transferred from the juvenile court system to Marshall County Circuit Court under youthful offender provisions. In Kentucky, those rules allow a suspect to be charged in an adult court if a judge rules the case meets certain criteria, Darnall said. A grand jury is expected to meet February 13.